New Delhi, April 10 (IANS) Gearing up for the upcoming Lok Sabha polls, the Aam Aadmi Party (AAP) on Wednesday launched the second phase of its campaign with focus on one-to-one communications. Launched by the AAP Delhi convenor Gopal Rai in North East Delhi's Babarpur in the presence of the Lok Sabha candidate from the area, Dilip Pandey, the mega public outreach programme will see party workers going from door-to-door urging people to support the demand of full statehood for the national capital. "We saw a large number of people coming for the rallies. But a large portion of people were left out due to their busy working schedule. We will now approach each and every individual in the city, so as to explain them about the full statehood demand and its importance. We want to explain to them how their elected government is made to suffer by the Centre," he said. "Our party workers and representatives will go to people on a mass scale. Our aim is to reach out to about 35 lakh voters in the city." He also said AAP's 13,814 booth presidents will lead the campaign and over 70,000 'Vijay Pramukhs' appointed by the party will also take part. "Our teams will read out the letter to the people and will also resolve their doubts related to the statehood demand," Rai said. Along with Kejriwal's letter, the party representatives also distributed a pamphlet in which Kejriwal describes the benefits the people of Delhi will get with full statehood. "The BJP and Congress have made promises of statehood for Delhi. But both the parties cheated the city and its people. AAP is your own party. If our MPs are elected they will get full statehood for Delhi," Kejriwal wrote in the letter, urging people to vote for his party. 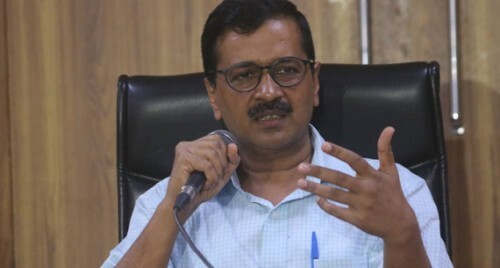 "Every Delhi citizen will have a house, youth will get job, admission will be easily done in the colleges, the city will be clean, sealing will be stopped, metro fare will not be hiked without the consent of people, all the unauthorized colonies will be authorized, issues of rural Delhi will be solved, officials will be held responsible to the people and the work will be done with speed," Kejriwal listed in the pamphlet.